In its latest campaign, the popular game show features people's reaction to Amitabh Bachchan's star appeal. The thrill of suddenly running into one's screen idol is indeed indescribable. 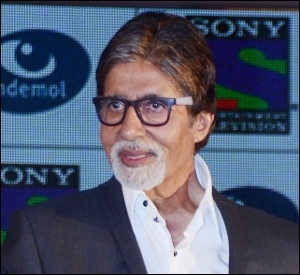 The current television campaign of Kaun Banega Crorepati (KBC) plays on the moments of stunned awe when people meet Amitabh Bachchan unexpectedly, and urge them to register for the game show to meet their icon. The campaign reiterates that by registering for KBC, people can get a chance to meet, talk to and shake hands with Bachchan, who hosts the show. Conceptualised by Leo Burnett, the campaign has four creatives. Two of the TVCs capture the reactions of a man and a woman who come across Bachchan. The tongue-tied, wide-eyed expression is hardly surprising for the star, who in a matter-of-fact tone tells them that if they want to meet him again, they should register for KBC. In the third TVC titled 'Height', Big B speaks directly to the viewers, explaining how he would look to people of different heights. And, the fourth video titled 'Cheque' has Bachchan showing cheques of various denominations to the contestant (camera), who eventually faints when he shows a cheque of Rs 5 crore. Speaking about how the team decided to highlight the aura surrounding the star, Ashwiny Iyer Tiwari, executive creative director, Leo Burnett, says that the idea was to make Bachchan look fresh in a slightly tongue-in-cheek, happy way. "AB comes across as a friend and even when he teases or pulls participants' leg, they don't feel bad. While money is a factor, people want AB as their friend," she says. Unlike the earlier registration campaign, this time the commercials were shot in a different manner, with Bachchan talking to the camera as a normal human being in a friendly, chirpy way, Tiwari adds. 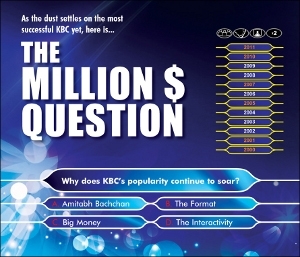 "Obviously, people are in awe of AB but even KBC is no more a game show or about money. Of course a life changing game but it has become more than a show," she says, adding that people are happy and satisfied when they get the chance to be on the hot seat and come face to face with Bachchan. She also says how they decided to change the look of Bachchan's specs and he was excited wearing orange and blue spectacle frames. 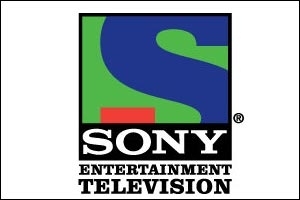 Unlike the first year of the show, this is the fourth year that Sony will telecast KBC; Tiwari says that the commercials were thus not required to sell the show. KBC's earlier registration campaign was on the idea of taking out time for oneself. The TVCs showed different scenarios where people spend their time on others at the cost of ignoring their own wants. Apart from television, the current campaign is extensively supported by radio, hoardings and digital. The channel will carry out below-the-line activities later, during its main campaign. The process of ideation for the main campaign is still on and may come out within two to three months, reveals Tiwari. The registration, which began on May 27, will continue till June 20. 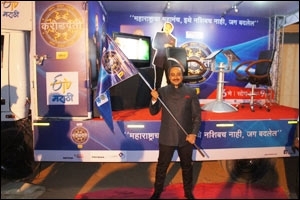 Suraja Kishore, national planning director, Publicis Ambience confirms that the aura and awe of Big B is certainly undisputed and will always be a big point in KBC's success. "When you watch this campaign, you can relate to the reactions of people coming face-to-face with Big B. Most contestants who have appeared have been more excited to be in his presence and have said that the fact that they could meet him and shake hands with him is in itself more than millions," he says. From a different perspective, he adds that the commercials do not reveal any new insight. "Here lies lazy thinking at work. It's a fact that anyone would be stumped when they meet Big B," he says. Despite this, Kishore believes that people will love the creative for the simple reason that they are fans of Big B. Kishore especially mentions the one titled 'Cheque', as it is closer to his logic of spinning insights and message around KBC. Charles Victor, national creative director, Law & Kenneth, loves the ones with Bachchan's solo act. "They are really unique! I like the 'Cheque' TVC the best because it's centred around the show and not entirely on AB's personality. Although AB brings the entire thing alive with some really entertaining acting!" he says. Victor believes that it's unfair to say the commercials merely ride on AB's stardom; the entire show runs on his stardom. "And, good job on the creative team's part for capitalising on his stardom in a refreshingly new, very watchable way. Especially the solo acts," he opines.